Katrina Alcorn is an author, user experience consultant, speaker, and expert on why women burn out at work. 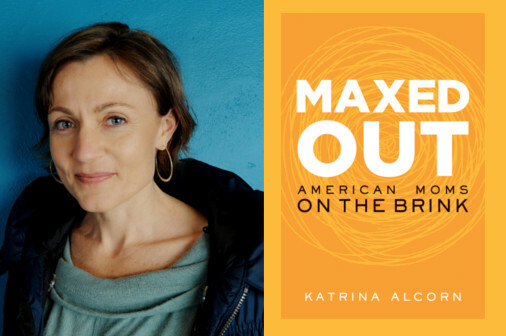 Her first book, MAXED OUT: American Moms on the Brink, is a brave memoir about her own experience with job burnout. Watch her TEDxMonterey talk, Maxed out -Changing the conversation about women and work, and follow her here: Consulting | Blog | Twitter | Facebook. 1MFWF: We often hear about the concept of a “super-mom”, who seems to have everything together: successful career, happy marriage, well-adjusted children. Is that a realistic picture? Katrina: I hope we can all agree by now that the supermom thing is totally unrealistic. I often talk about this dilemma many of us find ourselves in, where we’re expected to do our jobs as if we don’t have children, and raise our children as if we don’t have jobs. It’s impossible. We can’t be all things to all people—and we especially can’t do it alone. We need support from our partners, our friends, and our employers. 1MFWF: Work flexibility can make all the difference for a working parent, but sometimes one kind of flex just isn’t enough. Your employer allowed you to work an alternative schedule (arriving early and leaving early), but a part-time arrangement would have been a better fit. How does the U.S. stack up to other countries with respect to part-time opportunities? Katrina: Countries like the Netherlands are leading the way by making part-time jobs a viable option for just about anyone who wants them, including professionals like surgeons, lawyers, and engineers. This is great for work-life balance, and it also helps even out employment rates. The U.S., in contrast, stacks pretty low when it comes to giving women (and men for that matter) access to quality part-time jobs. A Pew Research Center poll found 60% of full-time working moms would prefer to work part time, but don’t have that option. And if you’re “lucky” enough to have to option to work part-time in the U.S., that option often comes with a stigma. Part-time workers are often seen by their coworkers as not really being committed to the work. Not only do you take a pro-rated cut in pay and benefits when you go part-time, but in many companies you may also make less per hour. It’s exploitative. We need to provide more options than just two extremes: full-time or nothing. 1MFWF: It also would have been helpful if you’d felt like you could leave your job for a chunk of time, and then return to the workforce without any difficulty. But it can be very hard to get back on the “Fast Track” from the “Mommy Track.” How so? Katrina: It comes back to that stigma again. We still have this outdated idea that the “ideal” worker is someone who puts work first. Always. Someone who never takes time off from his or her career. So when we do take a few years off to take care of family, employers look negatively at that gap in the resume. This idea of the ideal worker is totally out of sync with most of our lives. It’s important to remember that what we need changes over time. In my case, when my kids were babies, I needed to work less. Now that my kids are school-age, I find I have more energy and I’m ready for new challenges at work. In fact, I recently accepted a full-time job at a Fortune 500 company and I’m loving it. Of course, I still need flexibility, but my employer has been great about that. I think part of the reason I was able to ramp up my career this way was because I was never out of the workforce for that long. For each year a women takes off, it becomes that much harder to get back into her former career. I also happen to work in a career (user experience design) that is very much in demand, so I think I was lucky, too. 1MFWF: When you did ultimately leave the workforce, instead of feeling relief, you struggled with continued anxiety and depression. Your doctor seemed to think pills would be the answer; were they? Katrina: Mental health tip: If you know you need time off, don’t wait until you’re a basket case to take it. That was my mistake. I pushed myself right up to—and then beyond–my limits. By the time I stopped working, I was a complete wreck. It’s hard to describe what that felt like. People think it was a choice to quit, but there was no choice involved. My body wouldn’t let me keep going. Around the time I left my job I went on anti-depressants but the side effects were awful—I couldn’t sleep. I didn’t really start to feel like myself again until about a year later when I stopped taking the meds. I’m sure they help some people, and for all I know they helped me get through the worst of the depression, but it wasn’t a long-term solution for me. 1MFWF: Your book shares your very personal journey as a struggling working parent. Do you have any regrets about being open about your experience with burnout? Katrina: No, no regrets. What’s made it all OK are the countless emails and messages I get from women who tell me the book helped them. In the book one of the main messages I wanted to get across was that if you’re feeling maxed out, you’re not crazy, you’re not alone, and it’s not your fault. But I guess the response I’ve gotten from readers has brought that message back for me to my own life. It’s made me feel less alone. Telling this story has connected me to all these like-minded women who are struggling with the same issues that I was.